The Flying Dutch are heading to Thomas More College in the Cincinnati suburb of Crestview Hills, Kentucky, this weekend for sectional play in the NCAA Division III Tournament. Hope (25–4) will play St. Thomas, Minnesota (29–0) on Friday at 5 p.m. The other sectional semifinal pits No. 1 Thomas More (29–0) vs. No. 10 Washington-St. Louis (25–2). Friday winners will play on Saturday for a berth in the final four at Calvin College. Seating is limited. Tickets are $6 for adults and $4 for seniors and students. They can be purchased through the Hope Ticket Office beginning at noon on Tuesday, March 10. Call (616) 395-7890 for more information. There will be no online sales. 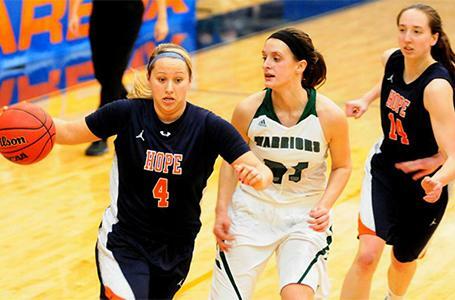 The Hope College women's basketball team beat Wisconsin Lutheran 72–47 Saturday in the NCAA Division III Tournament second-round action in Wheaton, Illinois. Coach Brian Morehouse has guided the Flying Dutch to the sectional round of the NCAA Division III Tournament for the seventh time in school history. The 2015 Hope College Dance Marathon raised $182,187.30, a fundraising record for the annual on-campus event. Dance Marathon has raised nearly $1.5 million since it began in 2000.